Ripe, juicy, pineapples are available year round. They’re easy to cut with a few simple steps and within minutes you’ll be enjoying the sweet taste of Hawaii. 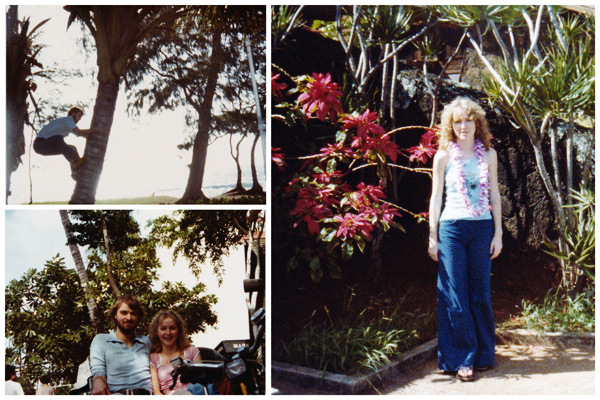 The year I got married, my husband and I were lucky enough to win a trip to Hawaii! One of the places we visited on that trip, 34 years ago, was the Dole Plantation. While we were at the plantation, we attended a demonstration on how to cut a pineapple. I’ve been cutting them that way (with a few minor changes) ever since. Recently I watched a video on how to cut a pineapple, and when she was showing her technique, I thought that’s not the way to cut a pineapple. I didn’t realize that there was another “right way” to cut a pineapple. So today, I thought I’d share my “right way” to cut a pineapple. First, select a pineapple that is firm and smells and looks fresh. You don’t want a strong pineapple smell because it may be over ripe. Pineapples are picked ripe so if you’re not eating it right away you should refrigerate it. Step 1: Twist off the top. 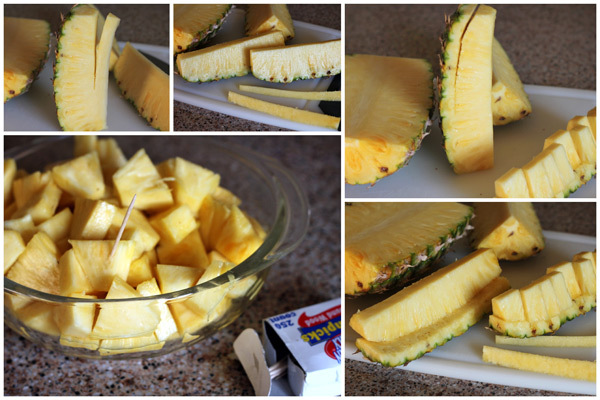 Step 3: Cut the pineapple into quarters. Step 5: Cut off the core. Step 6: Cut off the skin. Step 7: Cut into cubes. We like to eat pineapple as an appetizer before dinner. We also love it grilled. The caramelize grilled pineapple is so sweet and juicy. Just be sure and put it on a hot, clean grill and keep an eye on it so it doesn’t burn. oh i am the worst at cutting a pineapple or any melon really. i think I lack patience- dare I say! What a wonderful tutorial and one we always can use! Thanks I really needed that.. I always lose half of it and make a big mess. Excellent tutorial, Barb! I didn’t know the one could twist the top off! Wow what a great prize to win! I’ve never seen a pineapple cut like this before. I usually cut the top and bottom then slice off the skin while it’s still whole. Your method looks nice and easy! Great tutorial! I use the same method, but cut the top off. I didn’t know I could twist the top off! Delightful photos! Your method is the one I have always used, but it doesn’t make those nice “rings” with the holes in the middle. If I need rings, I make slices and then use a small cookie cutter to cut a circle out of the middle. Love your Hawaii memory! 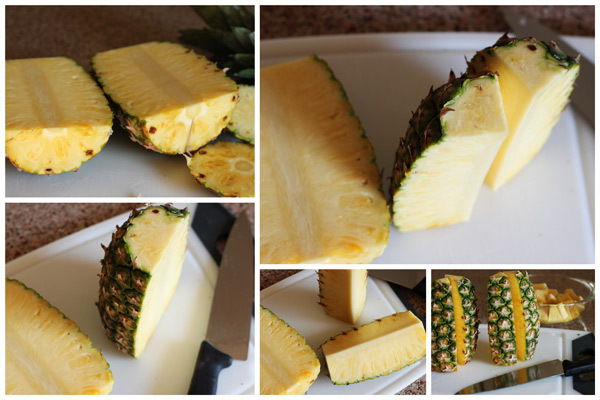 This is the way that I’ve cut pineapple for along time. But I wanted rings so I bought a pineapple gadget that works great! Pineapple from the grill is the best!!! Good post! Hi Jan – good to know the pineapple gadget works well. I’ve thought about picking one up when I want to do rings. 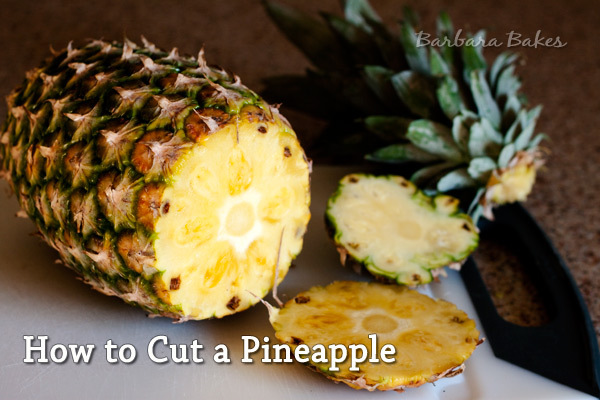 So glad you told me about this method several months ago, it’s how I’ve been cutting pineapple ever since! Thanks for inspiring me to do the post! We just got back from Hawaii! I missed a pineapple tour (if I had known before I totally would have booked to go, I love pineapple). This looks so much easier than the way I’ve always done it. I’d remove all the outside, then remove any leftover eyes, then cut into pieces. This makes a lot more sense. Thanks! Love the pics of you and your husband! Ahhh…I remember being that young, kind of..
Great tutorial. I love sliced fresh pineapple on the grill! I need to cut a pineapple but I want rings which I know is impossible. Pineapple upside down cake with chunks is just wrong! But this method is right on for most uses…I am so tempted to just ‘can’ my idea and use the pineapple for something else and get canned for my cake. Guess that’s equally wrong huh? Elise has a tutorial on cutting fancy rings http://www.simplyrecipes.com/recipes/how_to_cut_a_pineapple/. A lot more work but pretty. Also my pineapple upside down cake http://barbarabakes.com/2010/06/pineapple-upside-down-cake/ looks pretty with slices and it’s easier to eat than rings. Awesome! I have stoppped trying to cut my own, and got the fresh in the produce section. I will try it this way. This tutorial is great as it is easy to follow. I love it grilled too, I grill up hamsteaks and pineapple together, it is a great combo. Awesome tutorial Barbara. I will have to give it a try the next time I cut into a pineapple. 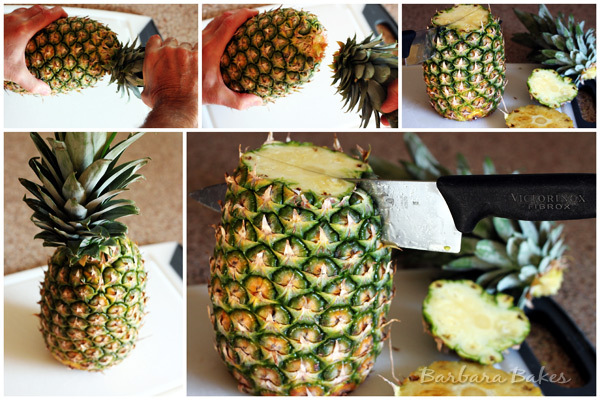 Love this tutorial, I’ve never cut a pineapple this way – I need to try it! And I love the pictures of you and your hubby! How fun!! Dude, that is awesome! I totally skip so many steps, and your way is so much easier. A great tutorial! Thanks for sharing.